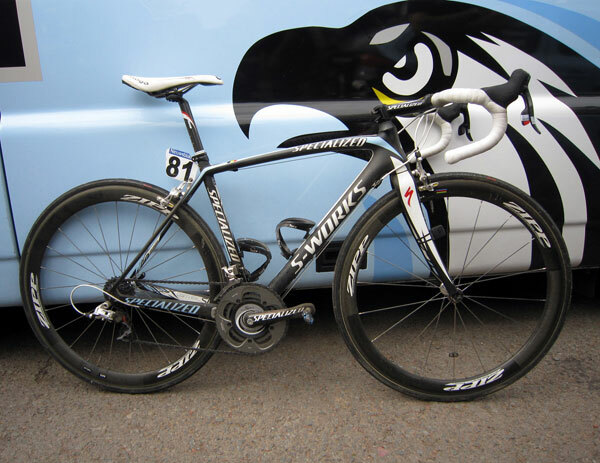 Nick Nuyens Tour of Flanders win was the fourth consecutive top result for Specialized at the Tour of Flanders with their S-Works Tarmac frameset. Fabian Cancellara won on a Specialized last year and Stijn Devolder (then Quick Step) for the two years before that. It was also the second win for SRAM since they took over as component supplier to the Saxo Bank team. The win is all the more impressive considering that the latest SL3 Tarmac model is no longer top bike in the ‘Big S’ range since the arrival of the much-vaunted and immediately successful Venge aero model. Not that aerodynamics would have helped at the famously tortuous Flanders route. According to a Specialized spokesman this afternoon, the riders have the choice of frame with most of them opting for the Tarmac – off-the-shelf price £2,099 – for Flanders with a few opting for the more comfort-orientated Roubaix model. Of course, that’s likely to change this coming weekend; the Roubaix model is so-named for a very good reason and the extra cobbles at the legendary forthcoming race are likely to earn a 100% team preference for sacrificing razor-sharp handling for a more stable ride. It remains to be seen whether the teams use quite as many carbon wheels at Paris-Roubaix as they appear to have have done at Flanders. However, the new Zipp 303s used successfuly by Nuyens last weekend were heavily promoted at the launch in the Autumn as developed for the cobbled classics, so it would be a surprise if this last weekend’s carbon whitewash won’t turn out to be a dress rehearsal for the queen of the classics. Chain and cassette complete with ‘Belgian toothpaste’. Although not much this year.